Samsung has flexed its smartphone muscle and dropped a couple more handsets to add to its Galaxy range. 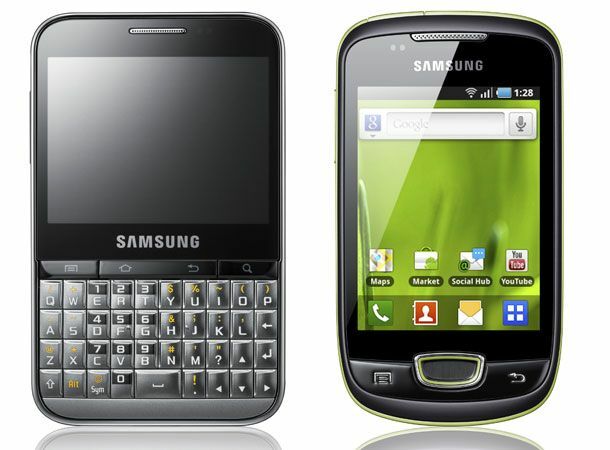 The Samsung Galaxy Mini and Samsung Galaxy Pro are Android 2.2 (FroYo) handsets each sporting a unique build. The Mini is, as you'd expect, a tiny handset with a 3.14-inch capacitive touchscreen, 3-Megapixel camera and 600MHz processor. It's a budget option for those to whom the Galaxy S or upcoming Galaxy S2 may seem a bit too expensive. The Pro is a blackberry-style device with a full QWERTY keyboard, albeit with a twist: the 2.8-inch display is actually a capacitive touchscreen, giving users the best of both worlds. It runs a slightly faster 800MHz processor, with the same 3-Megapixel camera as the Mini. Both devices have been confirmed for an April launch with Three, on a myriad payment plans.